The news about a new round of official peace talks between Taliban, the Afghan national government and US envoys are opening the door for some serious considerations about the future in one of the most troubled areas of the world. The Trump administration wants to get out of the country, without the American presence all the allies will withdraw as well, leaving the Afghan government on its own. By all means, Afghan armed forces aren’t ready to stand against the Taliban, nor they could be able to take back control from the warlords in the north. A few days ago I was thinking about the worst case situation; a full reverse to 2001, with Taliban in control of most part of the country, with ISIS ready to set up shop in Kabul and Pakistan in the role of the unofficial nuclear-powered protector. By all means, it will be a nightmare. Then I made up my mind, realizing that a significant number of changes had occurred in the last 18 years. One of the most recurrent topics in the action movies, back in the ‘70s, was the fighting sequence in a hall of mirrors. Hero and villain chasing each other in a long series of hit-and-miss, until the dramatic end. It’s a good metaphor for what’s going on in the Middle East. A pity that there are a lot of players inside the mirrored maze and I can’t see any hero ready to save the day. As predicted, things are getting hairy all over again in Syria, a place where too many conflicts are going on. The casus belli this time is the little town of Manbij, in the northern part of the country. Actually is controlled by Kurds, with logistic support from the US. Russians and Americans found themselves together against the will of the Turkish government to seize the town, a move that greatly enraged the leadership of this regional power. Check here the story, from Stars and Stripes. At the last G20 Summit, Vladimir Putin declares a s follows: “I provided examples related to our data on the financing of Islamic State units by natural persons in various countries. The financing comes from 40 countries, as we established, including some G20 members.” At the same table there were seated the envoys from Saudi Arabia and Turkey. Both countries have a difficult track record when it comes about terrorism, not to mention a number of high-profile representatives with direct ties with known terrorist and/or terrorist organizations. I was looking at a video about ISIS yesterday on YT and all of a sudden I remembered where I had seen similar black flags in the past. And the connection with the house of Saud became graphically clear. See this people? They were bedouin raiders, the flags are from the Ikhwan organization. What’s that? A creation of early days Wahhabi Ulama, back in 1913 (see here on Wikipedia) in order to convert potentially dangerous bedouin tribes into allies and muslims. The parallel is quite tempting. Ikhwan militia was a real force back then, helping a lot the cause of the House Of Saud in its struggle to get control in the country that we now call Saudi Arabia. At the same time they were somewhat indisciplinate and scores of them became difficult to control, forcing the Saud ruler to crush’em in 1929. The Ikhwan members were quite rigid in the application of the Wahhabi policies, including forced conversion of Shia muslims and enforce more control in the pilgrimage to the holy sites of Mecca and Medina. Since they want to be feared from their enemies, they applied a lot of gory practises like execution of male prisoners by cutting their throats. They opposed modernity like the introduction of gas, cars and telegraph – everything non-arab and not Wahhabi-like wasn’t welcome. Nowadays, seeing similar flags in the Middle East and in other countries and listening to similar messages from ISIS makes me wonder. The House of Saud is actively looking for getting more and more influence all over the Persian Gulf area and the whole of the North Africa. The same for Middle East and the other islamic countries. That happened in decades of financing Wahhabi imam and radical movements all over, without even a single word of disapproval from the USA. Back in the days Ikhwan turned against its creators and it took a while to get it under control (metaphor for “destroyed”) with the help of foreigners (mostly military advisors and personnel from UK). What will happen this time? Are the House of Saud rulers ready to discontinue their support for their black-clad allies? In the previous post I’ve left you with a question: what will be the outcome of the Paris attacks for ISIS? It’s a question with more than an answer and tells us something about cultural differences between Western audiences and the public in the Middle East countries. Topic of the day is Libya; what to do, what not and some note about an evolving situation. Be warned, the politically correctness has been banned here. So, if you are living in a fairy tale world this is the right time to get lost. Why all the fuss about this country? What does change in the last few days? Two magic words: media attention. The focus is about IS (*) activities in Libya and the Grand Guignol show they put up with mass execution of prisoners and the usual propaganda against the Western countries. They’re good with the media and they know how to play games in the ‘net, so finally the world discovers that Libya is a failed state. Well, thank you for coming my dear journalist but this party is already up and running since the fall of the late dictator, Colonel Muammar Gheddafi. 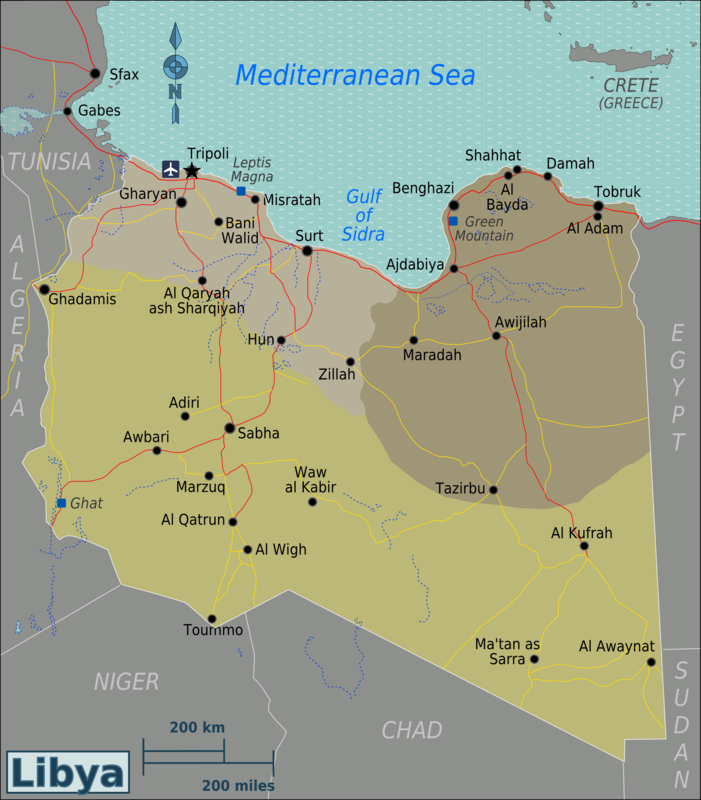 At the very beginning of this post you find the map of Libya. Now, please pay attention to a few factors. Firstly, all the towns are located near the Mediterranean Sea. So, it’s easy to say that if you control the shores of Libya then you control most of the country. Second, the national frontiers are with other problematic countries (Egypt, Sudan, Chad, Niger, Algeria, Tunisia) who already got their hands full with internal problems and have little or none resources to spare to be used against Libya. Third, the vast desert lands in the south are a no-boundaries zone – perfect for any kind of smuggling operation you may imagine. Now, take a look at this map.